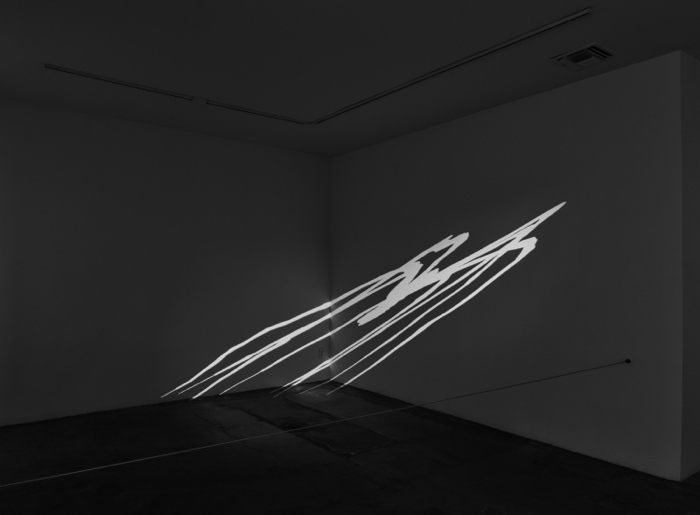 1301PE is pleased to present the debut of Los Angeles-based artist Ana Prvački's Stealing Shadows. Referencing, exploring and exploiting shadows with an imaginative and gently comedic approach, Prvački presents the stolen shadows of famous sculptural masterpieces without the presence of the original 3D object at a scale and angle befitting its location and site in the gallery. Taken from her 'inventory of ideas' that was published in book-form for her concurrent solo exhibition at the Institute of Contemporary Arts Singapore, the stolen shadows in this exhibition are the first physical manifestation of Stealing Shadows. With this body of work, Prvački presents unique stolen shadows of such iconic sculptures as Michelangelo's David, Marcel Duchamp's bicycle wheel and Louise Bourgeois' Spider. Each shadow can be customized to fit any given space and context with a variety of point sources. The value of each shadow is estimated at 1% of the original sculpture, based on the current market price. Ana Prvački was born in former Yugoslavia and lives and works in Los Angeles. Her multi-facetted work has been exhibited, amongst others, at the Centre Pompidou, Paris, Documenta 13, Sydney Biennial 2007, Istanbul Biennial 2015. Solo exhibitions include the Hammer Museum, Los Angeles; the Isabella Stewart Gardner Museum, Boston; Castello di Rivoli Museo d'Arte Contemporanea Turin; Institute of Contemporary Arts, Singapore. The exhibition will be accompanied by 'Finding Comfort in an uncomfortable imagination. A catalogue of ideas by Ana Prvački' published by the ICA Singapore.